Pinching her lips tight so she wouldn’t say anything else that might get her mom in a tizzy, Katie stomped back to the kitchen. Her mother was waiting, hands on hips. Slightly mollified, Katie leaned in next to her mother, admiring her own handiwork. Her mother sighed and turned away to rattle pans and poke at the bird in the oven. Later, the family sat around the table groaning and rubbing bellies busy digesting mashed potatoes, gravy, stuffing, yams, cranberry sauce, green-bean casserole, and Grannie’s lime, Jell-O-mold-salad. The uncles were discussing the best fishing spot on Lake Odell, and Grannie and Aunt Janice were fighting over which was better, cranberry sauce from a can, or the fresh cranberry relish Katie’s father had made. Katie snuck away to the kitchen to start the coffee and whip the cream for her pies. When she’d finished, she scooped the airy clouds of creamy sweetness into a cobalt blue bowl that had been her grandmother’s. Jimmie’s friend wandered into the kitchen with a stack of plates. He set them by the sink before coming over to where Katie was scraping the last bit of whipped cream into the bowl. “What’s that?” he asked, leaning in over her shoulder in a way that made her feel uncomfortable. “You’re in my personal space,” she said, turning with spatula in hand. She stared at the boy for a second. Was he for real? “What?” she asked, setting the spatula back into the empty mixing-bowl. “The can? This doesn’t come from a can. It’s whipped cream.” She gestured to the empty, cardboard container with it’s depiction of a smiling cow in green pastures. Katie didn’t reply. He’d never seen real whipped cream? She suddenly felt so sorry for him that she wanted to give him a hug. Instead, she pulled him over to the hutch where she’d stashed her pies so they wouldn’t get bumped during the cooking. 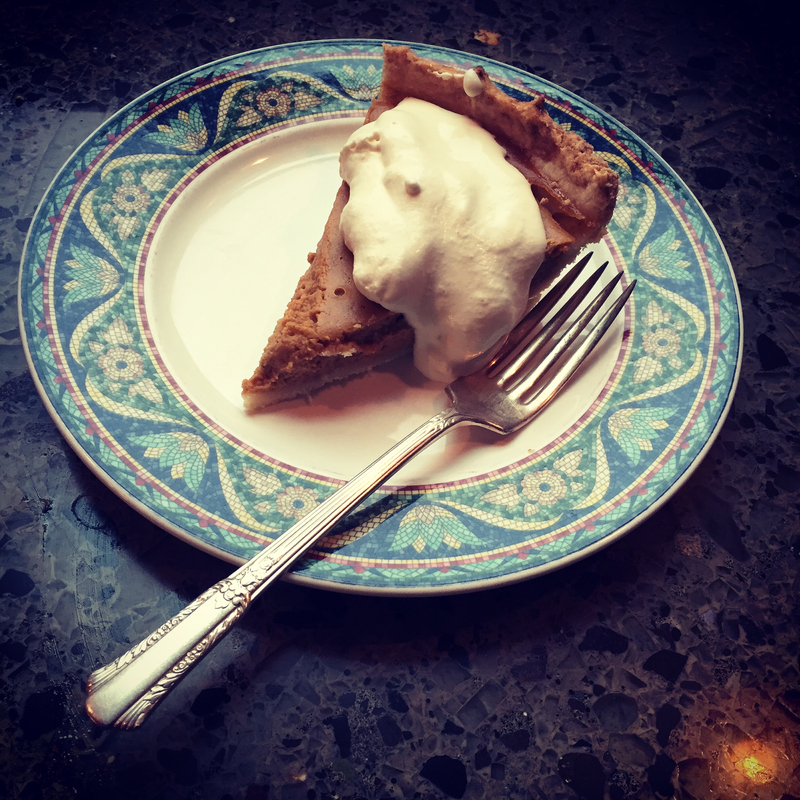 “Have you ever had homemade pumpkin pie?” she asked, glancing up to see his expression. He was kind of cute, with his eyes wide with astonishment as he gazed at her creations. “Who made those?” he asked, his voice full of the awe she’d seen on his face. “I did,” she said, smiling now. “Just wait until you taste them.” She snatched up the pie-knife and sliced him a piece, sliding it neatly onto one of the china plates stacked on the hutch. Chuck reached for it, and she slapped his hand. She practically ran to the other counter and came back with her bowl of cream and air. Like an artist applying her last dab of paint on her masterpiece, Katie spooned a round dollop of the whipped cream on the pie. Perfect. Chuck stared at the plate, his fork poised just above the dessert, but he didn’t cut into it. “What’s wrong?” Katie asked, glancing between the pie and his frozen fork. “It’s too pretty,” he said, his voice barely above a whisper. “It is gorgeous. Let me take a picture, then you can eat it.” She pulled out her phone and snapped the shot. That was one for Instagram. “Okay. Go ahead. Try it,” she urged, nudging Chuck’s elbow. He slipped the fork through the cream, down through the custard, cutting through the crumbling crust so that the tines clinked on the china underneath. As precise as a surgeon, he lifted the fork to his mouth. Katie watched with satisfaction as his lips pulled every last crumb from the fork. They were rather curvaceous lips too. “Mmmmmmm,” he moaned, his eyes rolling up and shut. “Well?” Katie asked, her heart beating faster. “Mmmmmmmm,” he said again, gently chewing and swallowing. He opened his eyes, gazing straight into Katie’s. Was that tears in his eyes?